Pete Seeger, the famous folk singer and environmental activist, died this week. 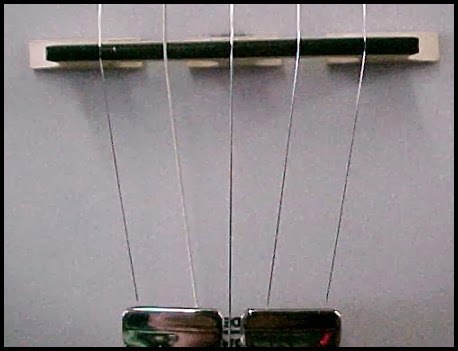 The "bridge" of Pete's banjo is somewhat unusual. 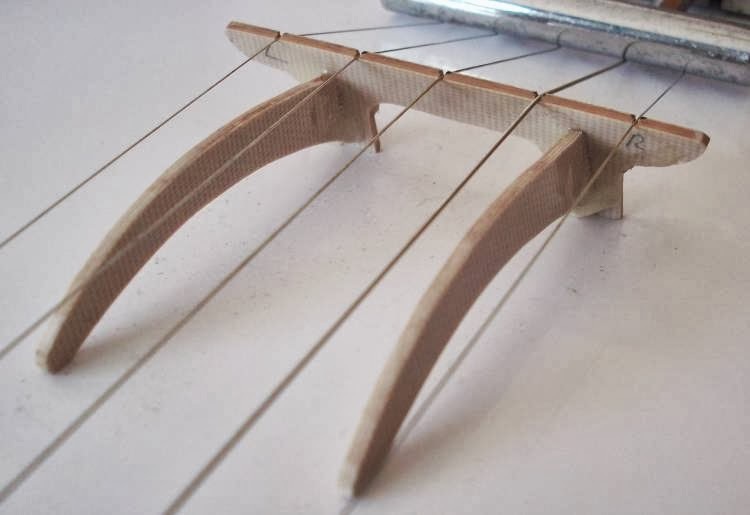 As I understand it, the point about the Seeger bridge is to excite a larger area near the center of the head than is possible with conventional style banjo bridges. Now there is a proposal to name another bridge after Pete Seeger. There is an old bridge called the Tappan Zee Bridge across the Hudson River north of New York City. But the current Tappan Zee Bridge was built in the Korean War and was only designed to last 50 years. It carries much more traffic than it was designed for and it is crumbling. It has been called "one of the most decrepit and potentially dangerous bridges" in the US. Anything from further corrosion to a minor earthquake or a maritime accident could bring it tumbling down. 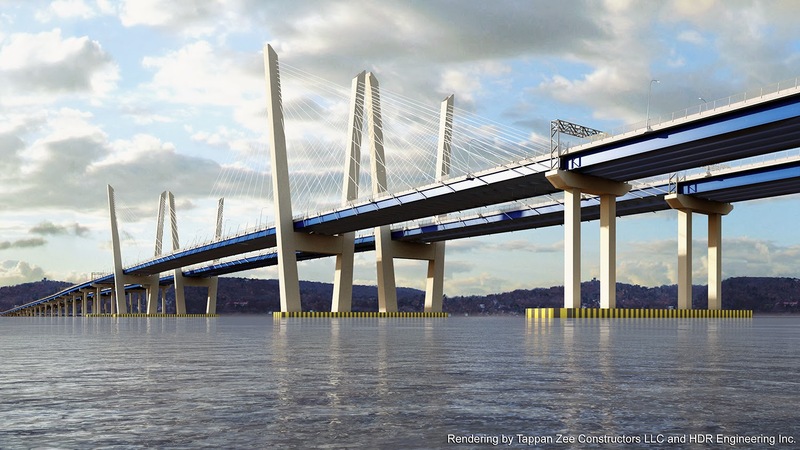 So the good people in New York State are building a brand new bridge across the Tappan Zee. As you probably know, for almost the last 50 years of his life Pete was active in promoting action to clean up the Hudson River through the the Hudson River Sloop Clearwater organization, dealing with everything from PCB contamination of the river caused by industrial manufacturing, to pesticide runoff, to harbor dredge spoil disposal. Everyone who enjoys water sports on the Hudson owes Pete Seeger a huge debt of thanks. 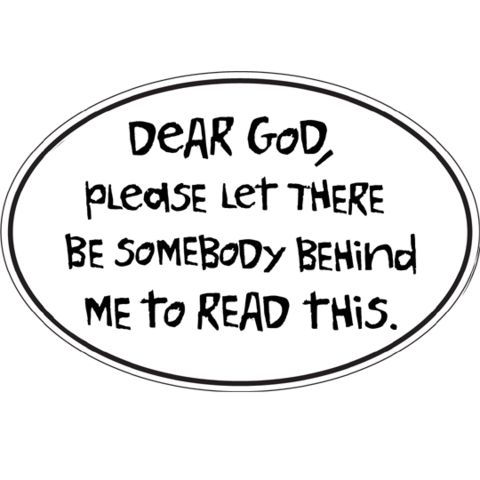 And now we can thank him, posthumously, in a very special way. Let's name the new Tappan Zee Bridge after Peter Seeger. What could be more appropriate? 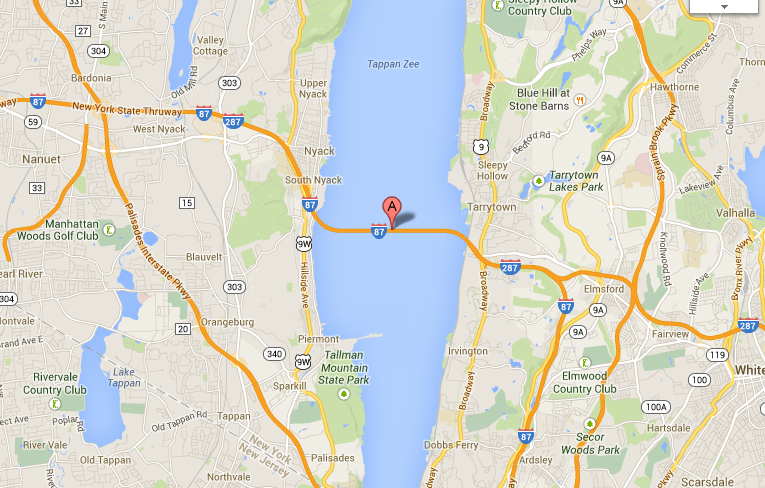 The current Tappan Zee Bridge is really called the Governor Malcolm Wilson Tappan Zee Bridge. Do you really want the new bridge to be called the Governor Andrew Cuomo Tappan Zee Bridge? Or would you prefer the Governor Elliot Spitzer Tappan Zee Bridge? It should be the Seeger Bridge. 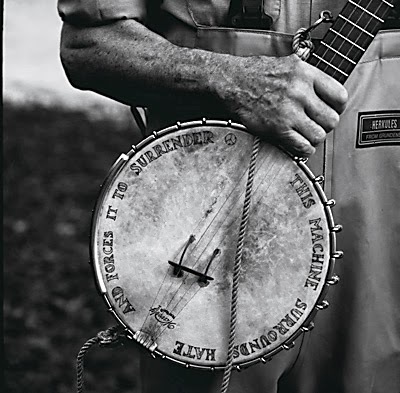 Peter Seeger deserves to be commemorated by something more significant than a banjo bridge. 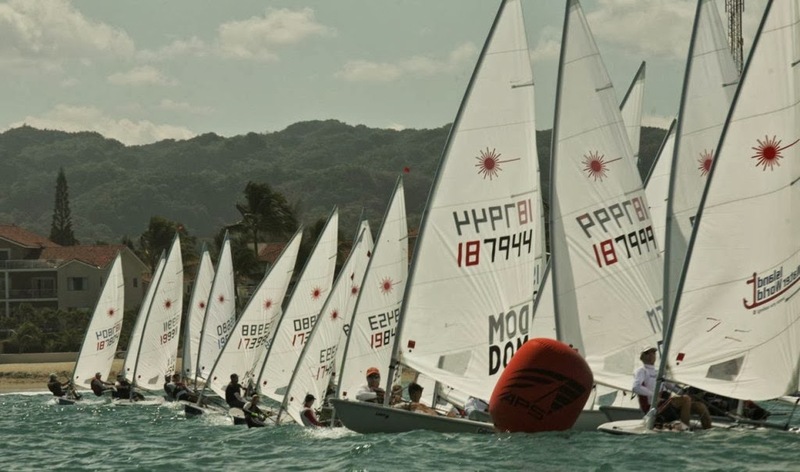 Congratulations to Amy Cox of Barbados for winning the Radial fleet at the 2014 Caribbean Laser Midwinters in Cabarete, Dominican Republic this weekend. I stole the picture of Amy from Scuttlebutt. 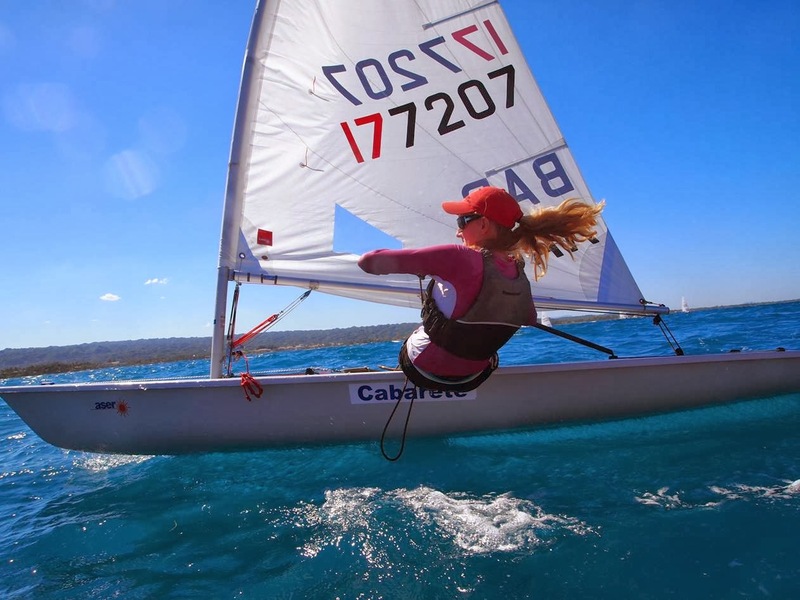 Isn't it just the perfect picture to explain why Laser sailing is so much fun and why many more attractive young ladies should participate in our sport? Also from Scuttlebutt is this picture of a start at the same event, with #187944 Ari Barshi either pulling off a perfect pin-end start or perhaps a perfect OCS. Whatever! My friend Peter Seidenberg was a very close second to Amy in the Radial fleet. 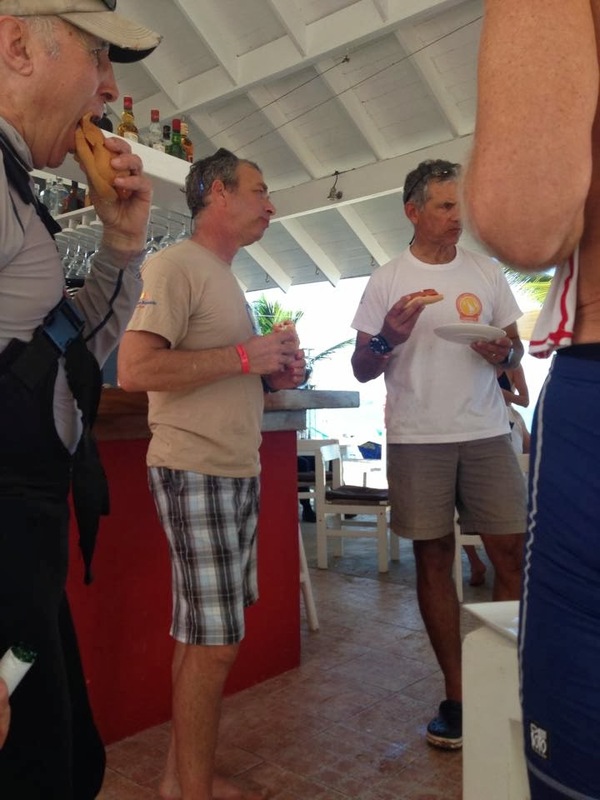 I can't find any photos of him sailing, so I will just have to post this one of him (on the left) eating a hot dog at the Eze Bar on the first day of the regatta. 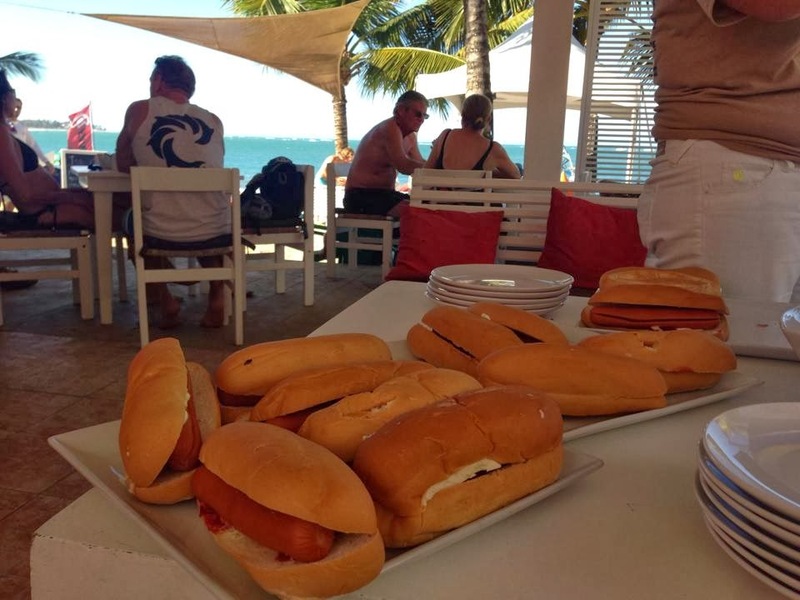 Isn't it just the perfect picture to explain why eating hot dogs and hanging out at the Eze Bar is so much fun and why many more attractive young ladies should participate in this sport? Laser frostbiting at Winthrop MA last Sunday. Yes! The daffodils are coming up in our garden. It's an interesting biological fact that daffodils are as smart as some human beings, at least when it comes to forecasting the weather. Daffodils are the dolphins of the bulbous perennial world. 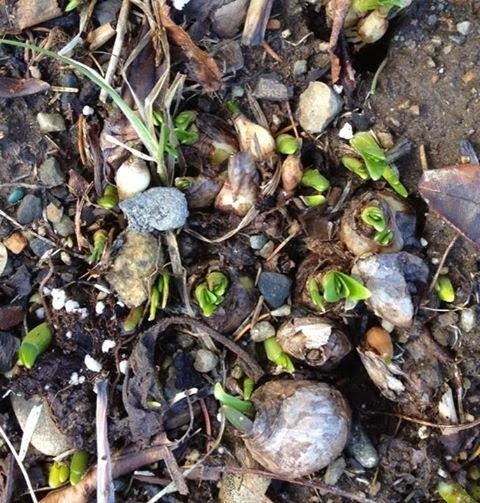 These little shoots, spotted Wednesday morning, are clear and irrefutable evidence that Spring is here. No more winter. No more icy cold weather. 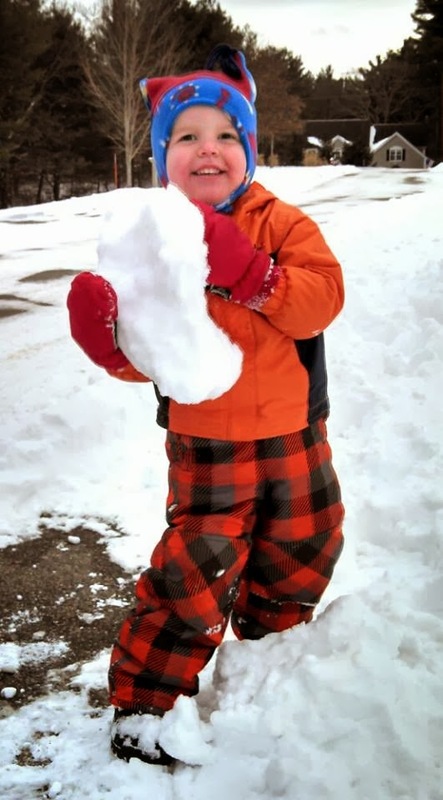 No more snowstorms. You can't argue with the daffodils. I hitched up my Laser and went over to Bristol. The temperature was in the mid 40s and the wind around 5-8 knots. He didn't say what cyclists usually say. ("Is that a Sunfish?") He actually knew it was a Laser. He had what sounded to me like an Australian accent and he said that he used to sail a Tasmanian Tiger. He implied it was similar to a Laser. 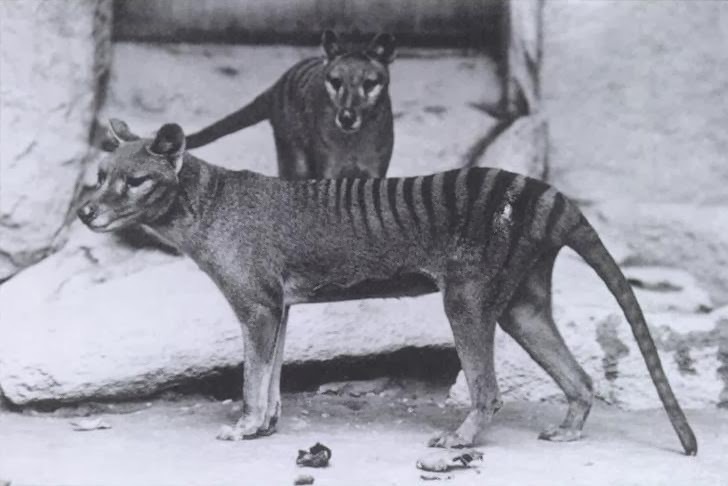 I had never heard of a Tasmanian Tiger. I had to look it up on the Wikipedia afterwards. Apparently it is now extinct. Then I had a wonderful sail on the harbor. There wasn't a single boat on the moorings. There wasn't any other boat of any kind on the harbor all the time I was sailing. Towards the end of my sail I saw several skeins of geese winging across the sky. It's an interesting biological fact that geese are as smart as some human beings, at least when it comes to forecasting the weather. Geese are the dolphins of the waterfowl world. These skeins of geese were clear and irrefutable evidence that Spring is here. No more winter. No more icy cold weather. No more snowstorms. You can't argue with the geese. 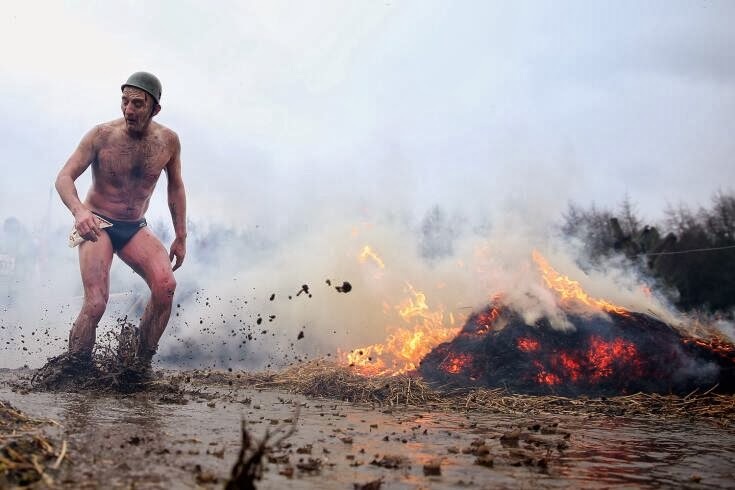 I found another blog to follow... Viking Vareo. 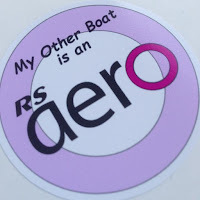 It's about another singlehanded sailor who, in some ways, is a lot like me. He is a Viking... like me. Well actually he probably has a better claim than me to call himself a Viking, even if I did officially change my name to Tillerman Bloodaxe. He lives in Sweden and his name is Per Åkesson. That little circle above the A definitely makes that an authentic Viking name, doesn't it? He used to sail a Laser, but he says he was never very good at it… like me. He enjoys sailing a singlehanded boat with an asymmetric spinnaker… like me. Except he actually went and did something about it and bought one. 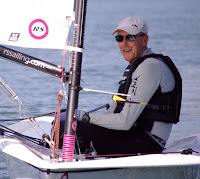 He sails an RS Vareo… like me. OK. OK. I only sailed a Vareo on vacation but at least it means I can understand what he is writing about and relate to it. He likes to go off and cruise around in his boat by himself and try to improve his skills. Just like me. Did I mention we are both Vikings? Back in November I wrote 5 Amazing Facts About Pufferfish. Well, the Pufferfish continues to amaze us, and I should have made it SIX amazing facts. Apparently, young dolphins have been observed purposefully and carefully chewing Pufferfish to get high. Yes, just like the behavior of certain young humans. What? 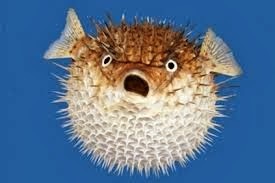 Don't they know that the Pufferfish releases a deadly toxin that can be fatal? This was a case of young dolphins purposely experimenting with something we know to be intoxicating. After chewing the puffer gently and passing it round, they began acting most peculiarly, hanging around with their noses at the surface as if fascinated by their own reflection. The original story can be found at Puff, puff, pass: Young dolphins deliberately chew puffer fish to get high with each other. Is this the most amazing Pufferfish story of the week, or what? 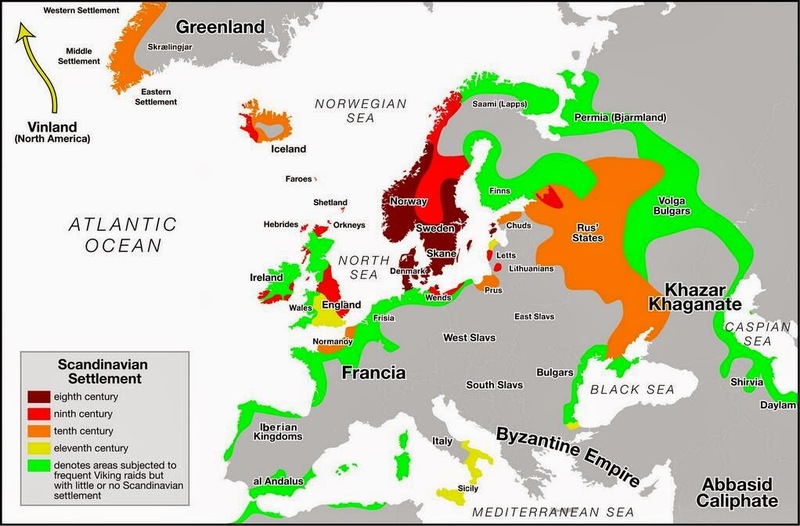 They sailed from their homeland in Scandinavia across the Baltic, the North Sea, and over the Atlantic to Iceland and Greenland and even to North America. They worked their way around the coasts of France and Spain and into the Mediterranean. Today's Map on Monday shows the areas settled by the Vikings from the 8th to 11th centuries. In the 9th century they invaded the north-eastern part of England led by such romantically named leaders as Ivar the Boneless and Eric Bloodaxe. 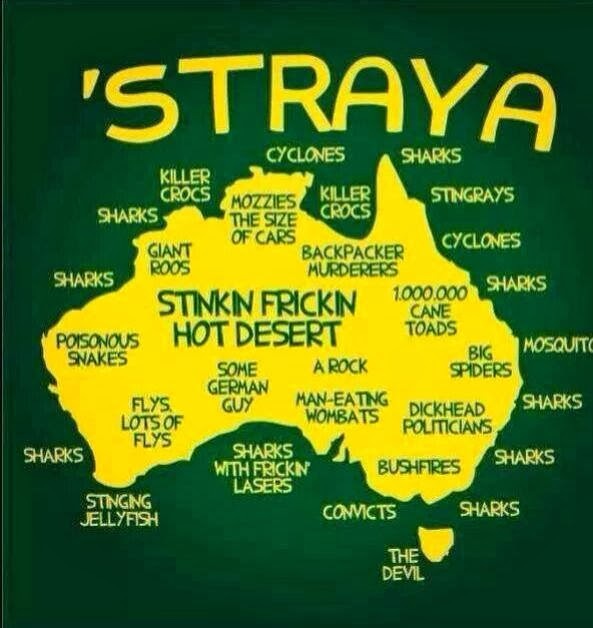 That's the part of the world where my family comes from. I am pretty sure I am descended from Vikings. Why else would I be so drawn to sailing and to wearing a hat with pointy horns? Who knows - I might even be descended from Eric Bloodaxe? Perhaps I should change my name to Bloodaxe? I think I'll go for a pillage now. Once again the question "Where am I?" is misleading. I am not currently at the location of this picture. I could be in this picture. I should be in this picture. So who will the first to guess the location? And, as a bonus question, if Tillerwoman were in the picture, what would she be doing? “I really don’t know why it is that all of us are so committed to the sea, except I think it is because in addition to the fact that the sea changes and the light changes, and ships change, it is because we all came from the sea. – John F. Kennedy, speaking at a dinner for the America’s Cup in September 1962 . 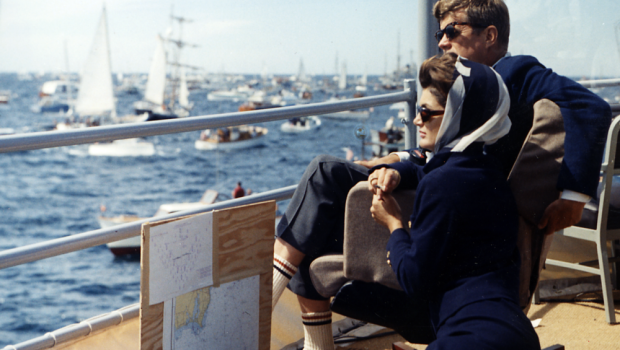 This must be the most often repeated JFK quote in the sailing blogosphere. It's so poetic. So romantic. It explains why we are drawn to the sea. And sailing. Common salt is sodium chloride. 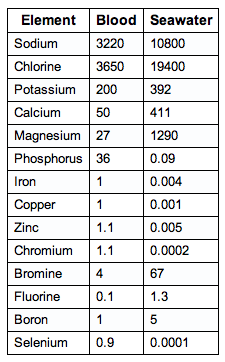 As you can see the concentrations of sodium and chlorine in seawater and blood are vastly different. We do NOT have in our veins the exact same percentage of salt in our blood that exists in the ocean. Nowhere near the same. Mr. President, I studied science. I know science. Science was a friend of mine. Mr. President, you were a fine president and an eloquent orator, but you were no scientist. Can everyone please stop repeating this nonsense? Helmets for sports have been in the news a lot lately. American professional football players do wear helmets but that has not saved some of them from suffering severe head trauma and subsequent problems after they retire such as Parkinson's disease and ALS and Alzheimer's and other forms of dementia at relatively early ages. 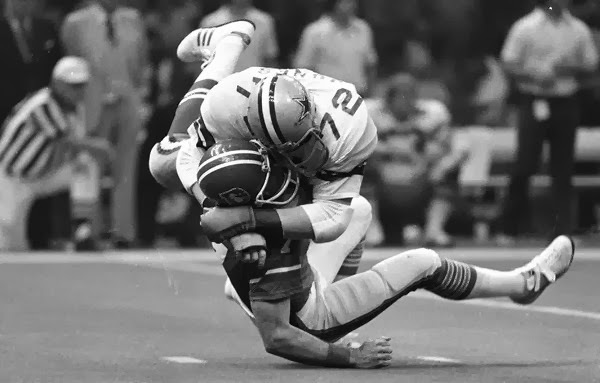 Yesterday it was reported that the NFL and lawyers for more than 4,000 former players, who said the league hid from them the dangers of repeated hits to the head, have agreed on the details of a $760 million settlement in compensation for retirees with head trauma. And a week ago, the former Formula One racing car driver, Michael Schumacher, was in a skiing accident where he hit his head on a rock, the impact reportedly splitting open his helmet. Schumacher is still in a medically induced coma with his prognosis uncertain. So people who get hit on the head while wearing a helmet can still get hurt. But that's not an argument for not wearing a helmet. Or is it? 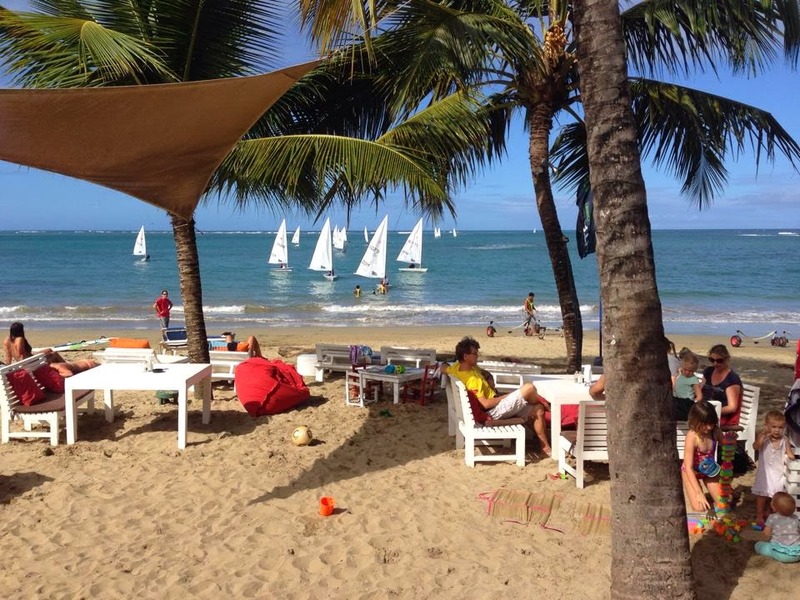 I raise the issue again because someone recently left a comment on a 2011 post of mine Kids Look Cool Sailing in Helmets. 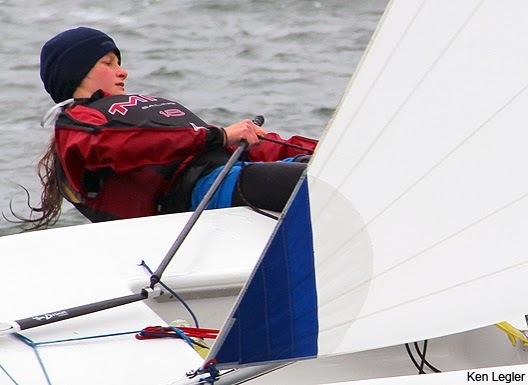 The initial comments (from older folk mainly) were somewhat dismissive of the idea of helmets in sailing. "Helmets are for the sissies and the uncool," said one reader. 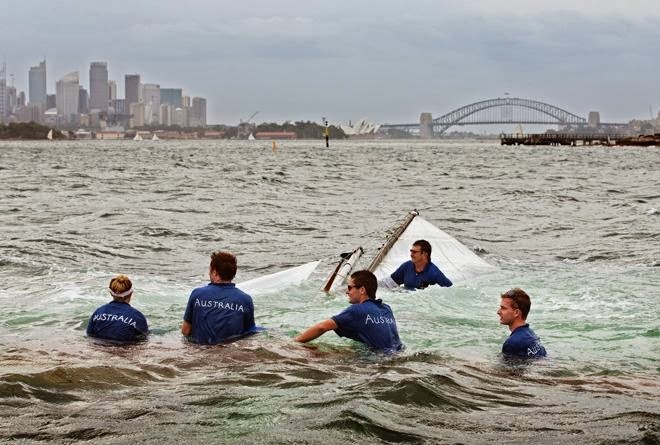 "Kids look cool sailing when they learn to freaking duck. 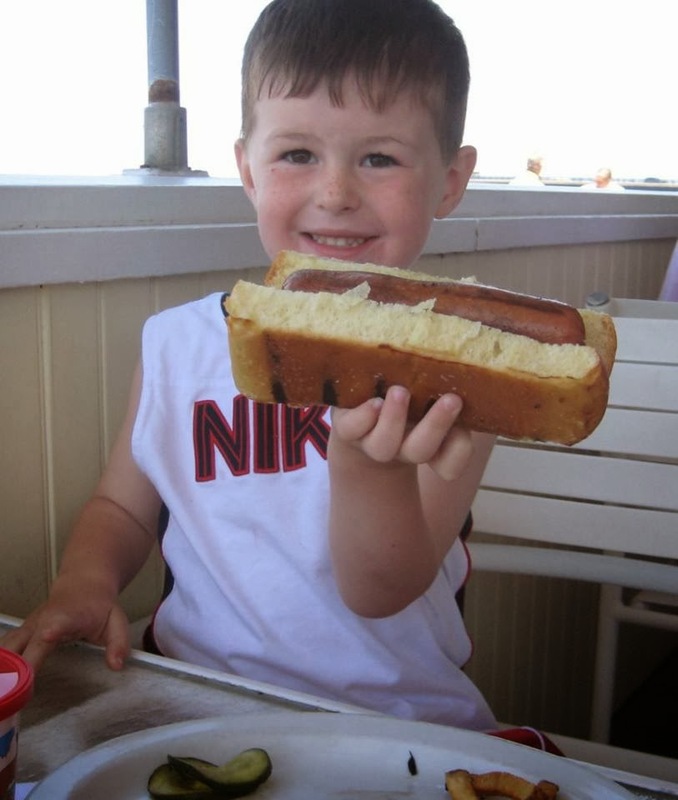 If they can't do that, then maybe Nanny should not let them out on the water," said another. The recent comment was from MIT sophomore Robyn Lesh and I will repeat it here in its entirety and let you reflect on her message…. I have been sailing I was six days old. Big boats, small boats, all boats. I now race in college and was NESSA sailor of the week earlier this year. I know boats and am certainly not a sissy. Last fall I got bumped on the head by an fj boom, not hard, not unlike other bumps like everyone has gotten from the boom at some point. Two hours later, I couldn't race worth ten cents. Two months later I am still concussed. I still can't think as clearly or as quickly as before and can not yet return to athletic activity. Helmets are NOT stupid or uncool. They are safe. Save your brain and consider a helmet. People who say helmets are uncool or dumb don't know how horrible a concussion is. Everything about YOU as a person is controlled by your brain. When you bruise your brain (concussion) everything from your smartness to your personality can be effected. My American friends always get on my case about how much it rains in my home country of England. They are wrong. I delight in pointing out to them that the average annual rainfall in England at 33.7 inches is actually less than it is in my adopted home of Rhode Island which "enjoys" about 46 inches of precipitation a year. 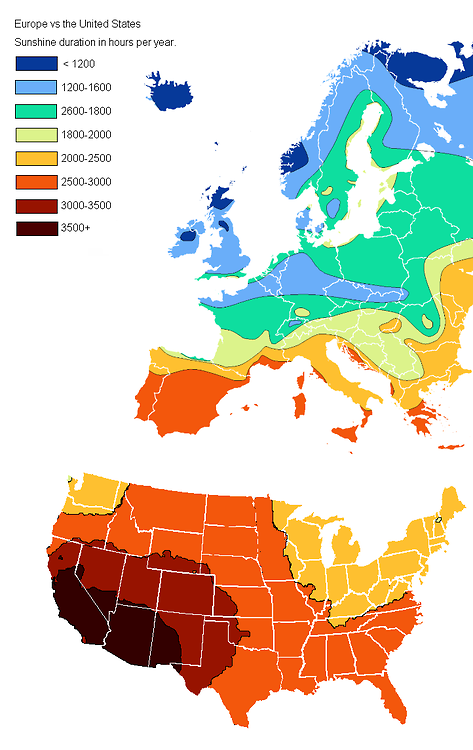 But as the map above so clearly demonstrates, every one of the lower 48 states in the USA does experience many more hours per year of sunshine than the United Kingdom (and most of northern Europe.) Even here in New England, tucked up in the far north east of the USA, our sunshine totals are comparable to Italy and Greece and northern Spain. We do notice it when we go back to Britain. So many days when we never see the sun. Cool grey days. There's so much I miss about our life in England. But not the grey. Grey is depressing. Sunshine lifts the spirit. A Speck in the Sea - Trying Very Hard to Die? Check out this remarkable story by Paul Tough in the New York Times magazine A Speck in the Sea, the story of a working fisherman, John Aldridge, who fell overboard from the deck of a lobster boat in the middle of the night off the tip of Long Island, of the search for him, and of his own efforts to survive and increase his odds of being found. 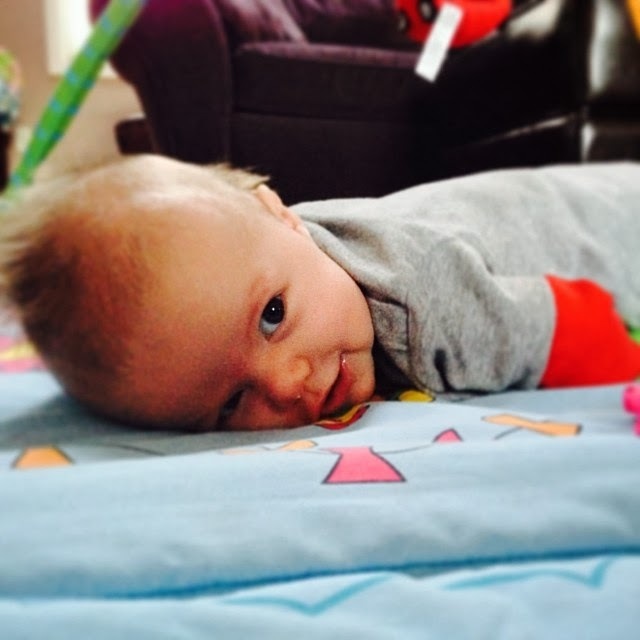 It's a long read - but worth it. 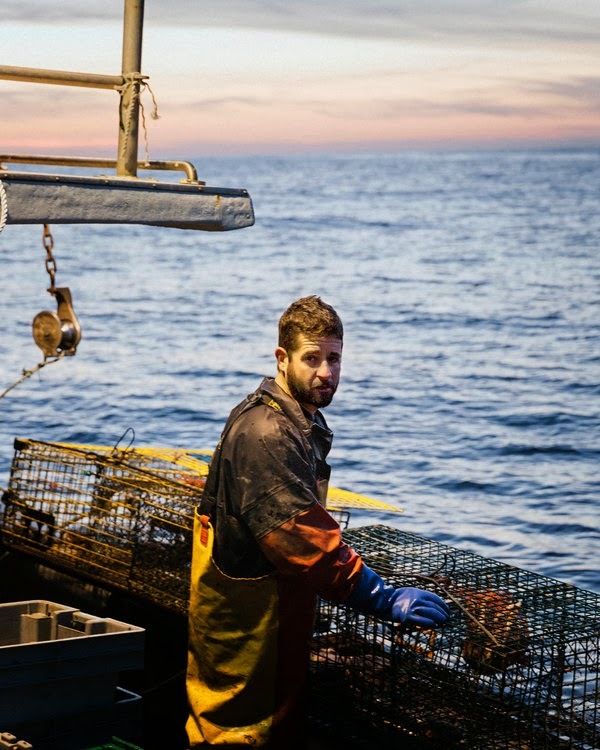 It filled me with huge respect for the hard-working brave men who risk their lives to put food on our plates, not to mention great admiration for the US Coast Guard and the volunteers who searched so diligently to find a "speck in the sea." 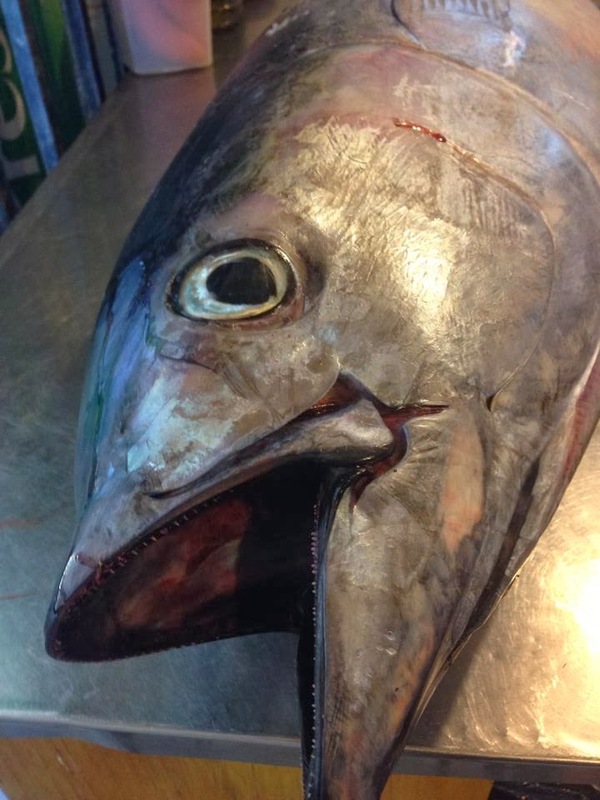 Vittone seems to think that commercial fishermen almost have a death wish. His article details the various actions that Aldridge could have taken to have avoided his accident in the first place, and the things that he and his fellow crew members could have done to mitigate the risks and improve his chances of being rescued. "Perhaps it is time for commercial fishermen to realize that their job is more dangerous than it needs to be, that most of the risk in their work is unnecessary, and perhaps they should stop trying so hard to die out there." Harsh words? Or common sense? What do you think? 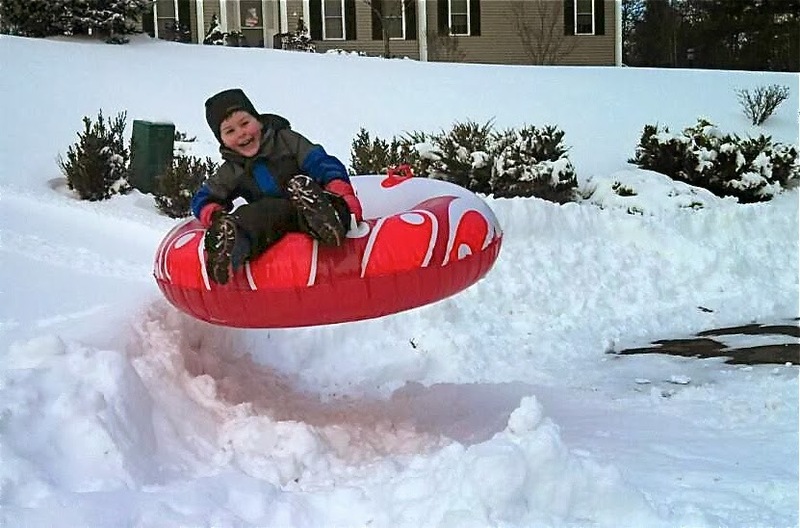 Or to be more precise - as this is not me and it clearly was not taken in New England in January - where was my grandson Aidan when this picture was taken? There are some clues elsewhere on this blog.